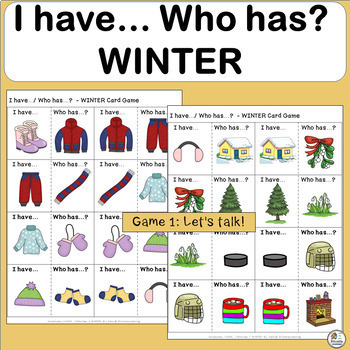 I Have, Who Has Games-Winter provides opportunities for children to practice identifying and naming items that can be found, and activities that people do, in the Winter. 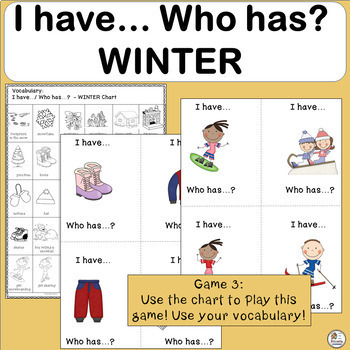 I Have, Who Has Games for Winter are great vocabulary builders for Kindergarten, Grade One and ESL classes! 30 bright and engaging pictures (that can be used as story starters). • One picture per card – 4 cards per page / open-ended. • The first player chooses any card and reads it. For example, “I have boots. 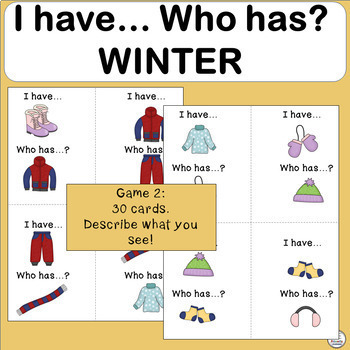 Who has a jacket?” That child then places that card in a container, that has been placed on the table. • Everyone looks at their cards to see if they have a jacket. The person who does then says, “I have a jacket. Who has snowpants?” That child places that card in the container, and so on. Other products included in the bundle! · I have… /Who has…? WINTER | FREE! 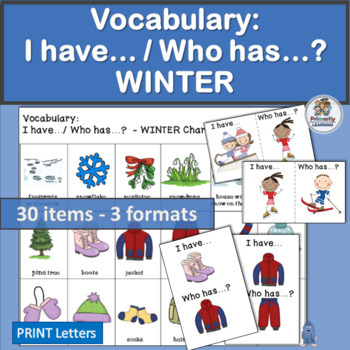 • Compound Words MEGA BUNDLE! • Phonics: Giant Letter Flashcards | Phonics is Jolly Fun! • Vocabulary: What am I? Learn about animals and their sounds! Also, follow me and be notified when new products are uploaded. New products are always 50% off for the first 24 hours after posting. It pays to follow me! Save on more great resources! Click here to visit my store! Please Note: These products were created as supplemental resources to complement teaching synthetic phonics programs like Jolly Phonics. These products were independently created and are not officially endorsed, sponsored or affiliated with Jolly Learning Ltd.